On March 15 in Algiers, a young protester brandished a sign bearing the title of this hit American novel and movie, in a witty rejection of "le pouvoir," local parlance for President Abdelaziz Bouteflika, 82, and the cast of mostly older decision-makers surrounding him. She's barely alone in expressing that opinion. Since February 22, Algerians have flooded the streets every Friday to protest a head of state they believe has been physically unable to carry out his responsibilities since he suffered a stroke in 2013. Bouteflika has not been seen talking in public since then, with actual workings of government left to a shadowy group of power brokers. Many Algerians her age have known no president other than Bouteflika, who was first elected in 1999. In 2014, he won in a landslide, at least officially, even though he couldn't campaign in person-- in his absence, aides brandished his portrait. The frustration and fury felt by many Algerians at this bizarre situation boiled over earlier this year, when a letter attributed to Bouteflika announced his candidacy for a fifth term in elections scheduled for April 18. Following a series of huge demonstrations, on March 8, another letter attributed to the president announced that he would abandon his bid for re-election, but was postponing the election until after a "national dialogue" later this year. The president's new plan left the street unconvinced. "We wanted an election without Bouteflika, what we got instead is Bouteflika without an election," one sign read. Algerians have not only taken back their right to protest, but they have done so in a peaceful and humorous manner, inspiring journalists to dub this "the smile revolution." The street's resounding rejection of the president's plan came in the form of perhaps the biggest protest since the country's independence in 1962, with demands centered not only on Bouteflika's stepping down, but also on evicting the unelected "deciders" who are widely believed to have governed in Bouteflika's name and allowed corruption to flourish. Local observers referred to one million in Algiers alone, although this is at best a guesstimate. Until February the authorities had enforced a de facto ban on demonstrations in the capital since 2001. 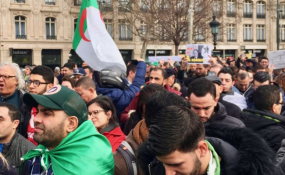 The police would use a heavy hand to disperse even a few dozen people who dared to gather to oppose a fifth mandate for Bouteflika or even demand a reform of the health system. With Algiers flooded by crowds too huge to contain, it's clear that the government has accepted that enforcing its own ban - a clear violation of the right to protest - is now out of the question. Indeed, on March 15, I saw only a couple hundred anti-riot policemen at Maurice Audin and Grande Poste squares downtown. But in the former, they quickly had to let the people pass to Avenue to unclog the roundabout. In the latter, I saw five police trucks very slowly making their way out of a gigantic crowd. By 4 p.m., police forces seemed to have disappeared altogether from the section of Didouche Mourad Street that connects these two squares. Families living along Didouche Mourad opened their doors to journalists and international observers who wanted to view the protests from above. From five floors up, I was able to film an impressive crowd chanting in unison "The people want the fall of the regime." By the end of the day, however, police reemerged. We heard reports that they had used tear gas in Telemly neighborhood, on the heights of this city built on a hill, and went there to verify the reports. Together with a human rights observer colleague, we entered a building where volunteer first aid workers were helping people suffering from tear gas exposure. We went to the roof and filmed police forces shooting teargas at a small crowd from a bridge, and young protesters flinging back the canisters. I didn't see any evidence that police used force disproportionately. Independent local media reported that the police were attempting to break up a group of "delinquents" who were throwing stones at them--a version corroborated by a witness interviewed by my human rights observer colleague, but denied by others. Later that evening, after the crowds had largely dispersed, groups of volunteers stayed behind to clean the streets, in a display of civic engagement that has happened repeatedly since the start of the uprising. Some of the volunteers even applauded police vans passing by--here too, a repeat of a seen several times in recent weeks in Algiers. I asked one of them why he applauded. His answer: "I'm not sure what happened in Telemly, but it's important for us to show policemen that they are not our enemies." That reminded me of a chant I heard at the beginning of the day in place Audin, addressing policemen while they were still trying to control the crowds: "Take off your (police) hats and join us!" Will the "smiling" spirit last? For now, elated citizens are just happy to enjoy the Algerian spring.